The lovely Cheri invitations gets a matching RSVP set: the petite A1 champagne pearlescent envelope and matching RSVP card. RSVP card in Champagne pearlescent cardstock measures 5x3.5 inches. Papers for both the RSVP card and envelope come from Italy. If you print, the rsvp card comes 4 to a sheet, so you print and cut. If we print, we cut to 5x3.5 inches. Templates for both parts comes with the kit. French wired ribbon finishes this oh so chic Vintage Style Wedding Invitations. Layers of diecut invite sheet and mounting card tie together, the rsvp set fit neatly into the diecut ribbon slots. 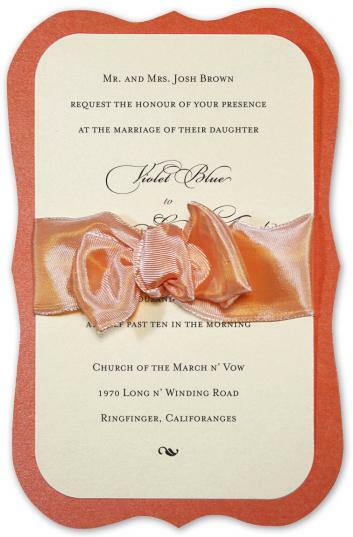 Orange mounting card, champagne invitation card with round corners. Generous size: Full invitation measures 8 inches x 5.5 inches wide. (A8 size). Melon Orange pearlescent mounting card. Outer envelope: A9 Outer champagne pearlescent envelope is available for extra charge, if you want to do a double envelope. Mailing Envelope:Matching champagne A8 70lb pearlescent envelope from matching Italian paper.